In recent years I have been a frequent visitor to Neistaflug, the town festival of Neskaupsstaður held on the first weekend of August. 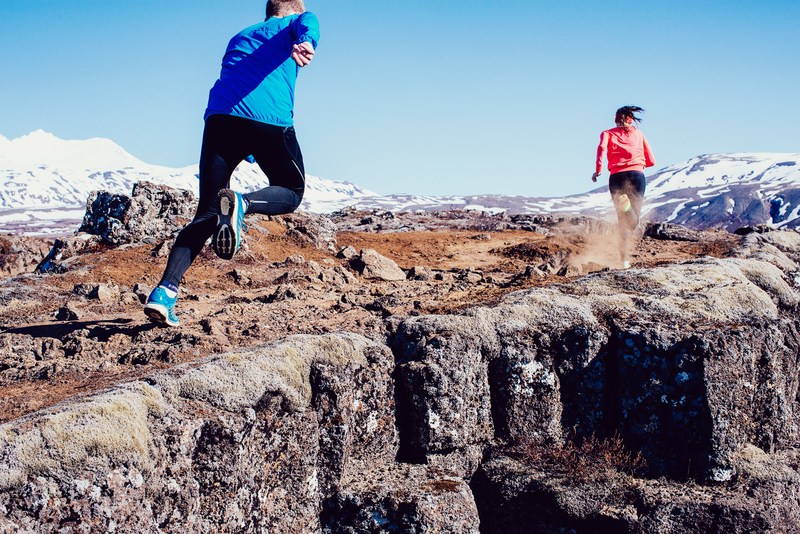 One of the annual events of the weekend is the Barðsnes trail race (Barðsneshlaupið), a 27km race from shore to mountain which Ingólfur Sveinsson, from my running group Laugaskokk, established in 1997 and has been held ever since. 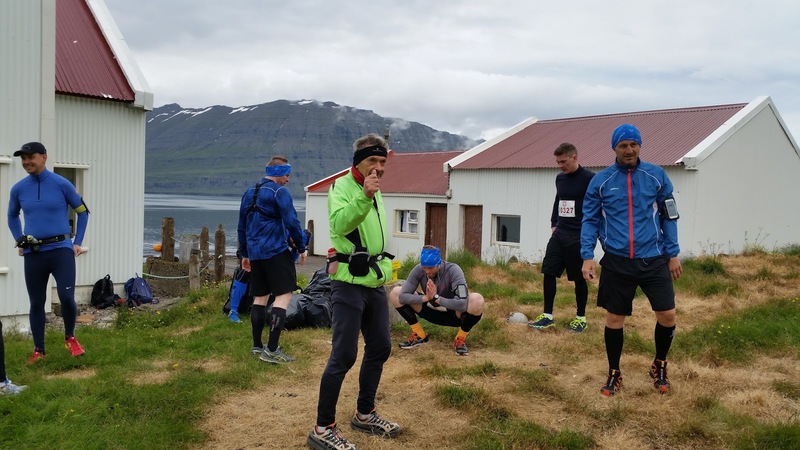 This is a race report from Óskar Þór Þráinsson who was kind enough to allow Running in Iceland to publish his story. I have watched runners in various states stumble over the finish line and often wondered why people would put themselves through this. After I caught the running bug myself my idea of trail running changed and I began to comprehend why runners do participate in these endurance events. I trained rigidly in the summer 2014 and registered for the half Barðsnes distance which is called “Hellisfjarðarhlaupið” (“hlaup” means “race” in Icelandic). It is 13km and covers the second half of the Barðsnes route. The race was the toughest I had participated in but at the same time I decided that next time I would run either the full route or nothing. A year later, on 1 August 2015, I stood on the pier in Neskaupstaður at 9 am ready for action. The race starts at the farm Barðsnes and all runners are ferried by the local rescue team in a large rubber dinghy across the fjord. From there, runners need to run in and out of three fjords until the race ends in the centre of Neskaupsstaður. 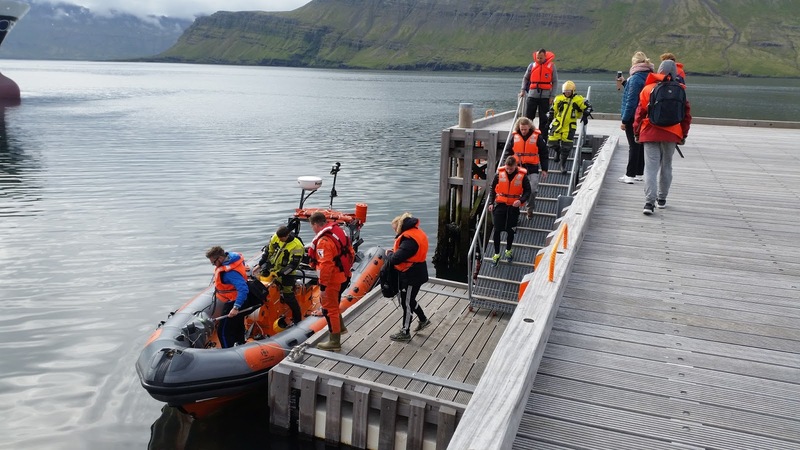 I had learned (from bitter experience) the previous year to be well prepared for the boat trip as it gets fairly cold in the middle of the ocean. 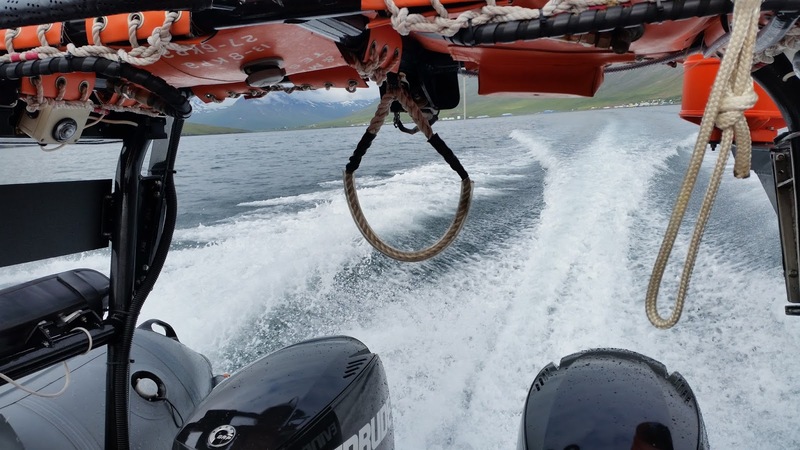 Runners in life jackets climbed aboard and the boat sailed at full speed across the fjord. We sailed to a small cove and jumped from the boat to the shore. Most of us managed to do that without getting our feet wet. We got a generous reception from Ingolfur Sveinsson and his family at his country house. We filled up our water bottles and tried to get a slight warmth in our bodies before the race start. The weather was good, cloudy but bright and a light breeze, ideal conditions for running. The view from Barðsnes is tremendous. You can observe the running route as one can see the three fjords; Viðfjörður, Hellisfjörður and Norðfjörður. It would have been nice to linger for a few hours but the stress and the excitement made it impossible for me to sit still and enjoy the view. The runners are split into two groups, the first group with the slower runners started right away but the other group an hour later. Ingolfur explained loosely the route and the main obstacles astnobody knows the trail better. The gun went off and we ran into the first fjord at a fast pace. The route was more or less on an old tractor trail for the first 7km into Viðfjörður. The group started to spread out as the trail became more crooked with rocks and irregularities. 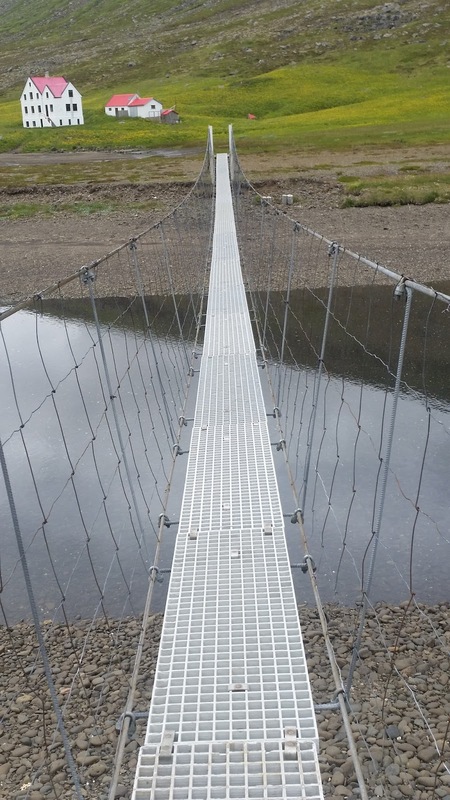 There was no one in sight when I reached a suspension bridge over Viðfjarðará at the bottom of Viðfjörður valley. I got quite distressed when I was running over the shaking bridge. 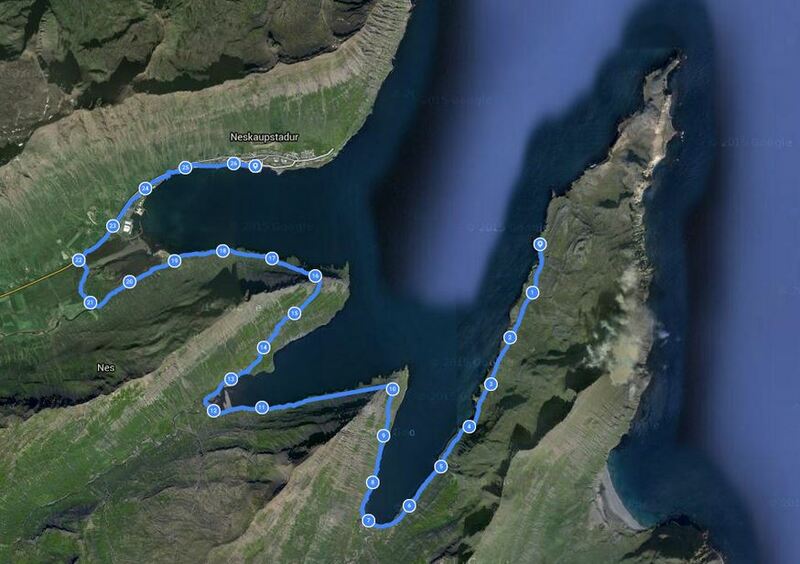 Now we were running on the other side of Viðfjörður on horse and sheep paths until we reached the first aid station. Thereafter we had to go over Viðfjarðarnes peninsula which is about 130m above sea level. This is followed by a steep downhill path to Hellisfjörður where one has to carefully watch each step. I was pretty worn out after running 12km in 90 minutes on very uneven terrain. However, the sun broke out for a few minutes and lifted my spirits. When you have run a long way into Hellisfjörður you must cross the river Hellisfjarðará. It has a gravel bottom and low currents but the water almost reached up to my knees. On the other side of the riverbank the trail continued through a grassy plain. I knew that the second group had now started the race and in that group was Iceland’s best trail runner, Thorbergur Ingi Jonsson from Norðfjörður, a multiple winner of this race who also holds the course record. I knew it was just a matter of time before he would overtake me. 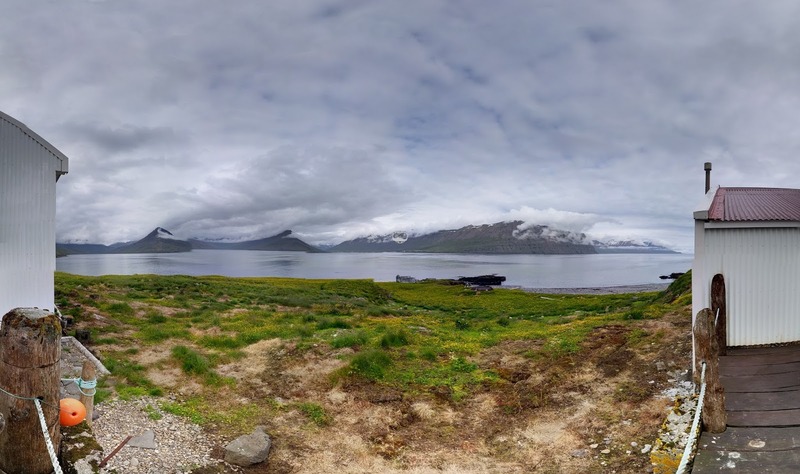 I sped up a little bit out of Hellisfjörður and managed to get to the next aid station where Thorbergur rushed past me not looking tired at all. I will proudly tell my children and grandchildren that I managed to run half the Barðsnes trail race before Thorbergur reached me. I was now at the starting point of the Hellisfjarðarhlaup I had participated in the year before, so I knew what lay ahead. 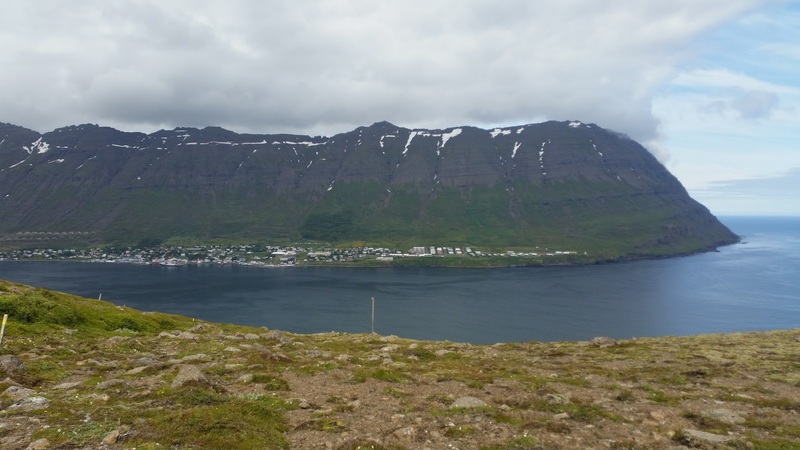 The toughest part of the race is running out of Hellisfjörður on narrow sheep paths up to “Götuhjalli”, 270m above sea level. Up there you get a clear view over Norðfjörður and you can see far and wide, even the finish line on the other side of the fjord. The nature and the environment overwhelmed me and I felt wonderful to be running in these beautiful surroundings. After that there was a rough 2km part on a steep hillside of gravel and loose rocks, winding down to the lowlands of Norðfjörður. In the Norðfjörður countryside the trail crosses a river at Grænanes. The Norðfjarðará river can have strong currents so there is a rope strung over the river between a fence and a car on the other side. It was definitely needed, as the water level had risen in the sunshine that morning. As I had fallen into the river the year before I was extra careful now and made it across without incident even though the water was above waist height. Next I ran alongside the local golf course past the last aid station to the asphalt road that is followed the last 4km of the race. At this point I decided it was do or die for me. 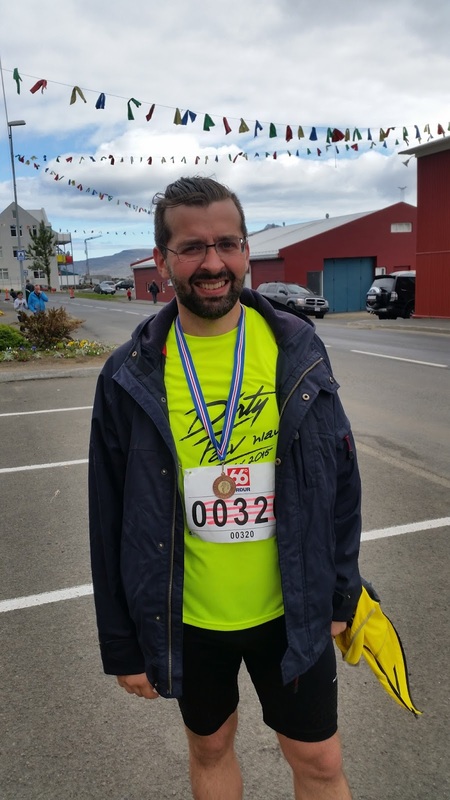 I gave everything I had left and managed half-marathon pace into Neskaupsstaður. I reached the finish line, just a few minutes behind my goal time, exhausted but happy! To finish the race after three hours in a tough environment was an incredible feeling. I had my mind full of nature, running, endorphin and a sense of accomplishment. I can sincerely recommend this race. The Barðsnes trail race is one of the best I have taken part in so far, but also the toughest and not at all for the unprepared. It was one of the high points of the summer for me and I can see myself running it again.